Best grown in poor to moderately fertile, dry to medium moisture, well-drained soils in full sun. Excellent soil drainage is essential for growing this plant well. Does poorly in moist to wet soils where plants are susceptible to root rot. Plant stems tend to lodge (fall) in the summer, especially if grown in fertile soils and/or part shade. General foliage decline often occurs in high humidity summer climates such as the St. Louis area. Prune plants in spring to control growth, but be careful to leave sufficient numbers of live buds on each stem to facilitate bushy growth. Never prune stems to the ground. Foliage may also be lightly sheared in summer to shape, but avoid pruning in fall. Not reliably winter hardy throughout the St. Louis area where it should be planted in a protected location. Noteworthy Characteristics: 'Powis Castle' is a bushy, woody-based perennial or subshrub which is grown for its aromatic silvery foliage. It rarely flowers. Foliage is finely divided and feathery in appearance. Typically grows in a shrubby mound to 2-3' tall and as wide, but spreads by underground rhizomes and may reach 3-6' wide if not restrained. Essentially evergreen in warm winter climates. 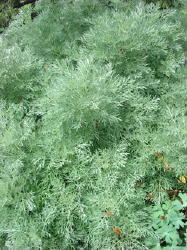 It is most likely a hybrid (Artemisia arborescens x Artemisia absinthium). A Royal Horticutural Society of Great Britain Award of Garden Merit plant (1993). Problems: Click for detailed list of pests and problems. Plants tend to open up in summer. Susceptible to root rot in moist soils, particularly poorly drained ones. Watch for rhizomatous spread. Uses: Silver foliage provides excellent contrast to flowering plants and green foliage in borders and herb gardens. Good selection for areas with poor dry soils. Asparagus meyeri is an evergreen arching perennial that has feathery, needle-like, stems. 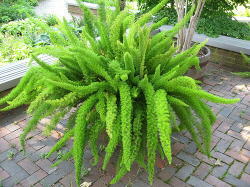 Foxtail Fern is often thought of as a fern but really it is not a true fern, i.e. it produces seeds rather than spores. This "Fern" is however related to the vegetable Asparagus which also has fern-like foliage. Foxtail Fern is very similar to Asparagus Fern only its growth habit is very dense and it produces tail-like fronds for a fluffy "Foxtail" look. 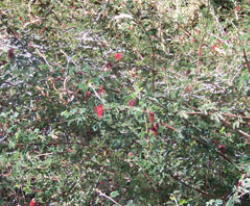 In the summer the plant has small white flowers that are followed by bright red berries. The plant can grow 2 feet in height and to a width of 3 to 4 feet. Unique growth habit makes it an outstanding accent plant in any garden also makes a great hanging basket. Botanical: Bulbine frutescebs "Tiny Tangerine"
this dwarf form of the orange Bulbine is great for small spaces. Native to South Africa, this clumping succulent spreads by rhizomes (underground stems) to create low mounds to one foot tall by 1.5 feet wide. The cylindrical succulent, dark green leaves are about 4 – 6 inches long, resembling those of green onions. 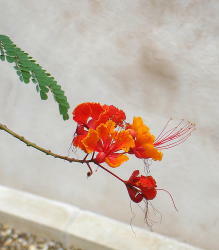 From fall through spring the plants are topped by 12- inch-long spikes of orange flowers. For the low desert, some shade is recommended to avoid leaf tip burn. It is ideal in containers, as an understory plant beneath desert trees, or in tight plantings places along sidewalks and entries. Plant in full sun to part shade, and in well-drained soils. Hardy to 10° F. USDA Zone 7. If our hummingbirds could vote for Plant of the Month, this would be one of their clear winners. Our Baja Fairy Dusters are almost constantly in bloom, and almost constantly being visited by hummingbirds, bees, Marine Blue butterflies, and even orioles! This loose shrub with criss-crossing branches doesn't quite reach 3' high before sprawling out to a width of nearly 6'. 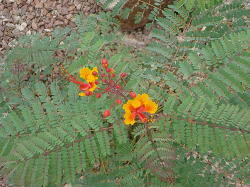 Its dark green leaves are like tight miniature ferns, overshadowed by red spikey flowers. The seed pods are like snow peas (when ripe they explode – one is visible in the center of the photo below). Although no babies have sprung up from the ground, the seed germinates readily in our greenhouse*. Native to sandy washes, flats, and hillsides in the Cape region of Baja California, ours are perfectly happy with full sun to light shade in clay soil with good drainage at the foot of the Santa Monica mountains, with water ranging from lightly once a week to deeply once a month. They are evergreen; it is reported that they will loose their leaves if drought or cold stressed, and in their native habitat bloom after spring and fall rains. 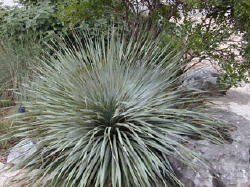 The specimen pictured below rises above a groundcover of big-leaved Beach Strawberry (Fragaria chiloensis) amidst a few Red Yucca (Hesperaloe parviflora). 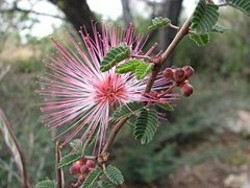 If you're looking for a daintier plant, Calliandra eriophylla is a smaller version with darker leaves and pink flowers native to a wider range of California and Texas; we find it not as vigorous. 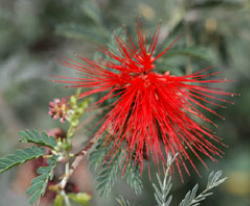 If someone finds a source for the larger Calliandra peninsularis, please let us know! * Propagation tip: To catch the seeds before the pod opens, we put small bags made of cheesecloth around the pods as they start to brown (or collect the pods when they feel dry and crispy but before they pop open). The seeds germinate in about 5 days. Because the thin tap root runs along the bottom of a seed tray, potting up seedlings can be tricky. The roots also go straight to the bottom of a pot and then circle. Because of this, we found it best to plant the seeds directly to a 2" rose pot (one per pot) in spring, then pot up frequently to a slightly larger pot (such as 3.5", then 5") until we reach a one gallon size. It's labor intensive, but we feel it builds a better root mass. 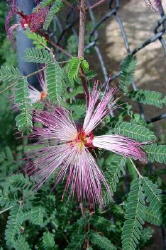 Calliandra eriophylla, commonly known as Fairy Duster, is a low spreading shrub which is native to deserts and arid grasslands in California, Arizona, New Mexico and Texas and Mexico. The flowers, which appear between late winter and late spring, have dense clusters of pale to deep pink stamens and are about 5 cm wide. 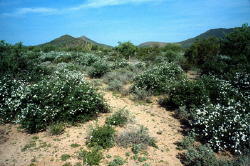 The shrub is usually between 20 and 50 cm high and has bipinnate leaves. 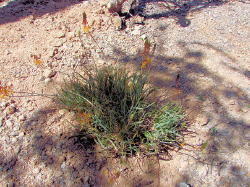 Alternative common names for this species include Mock Mesquite and Mesquitella. An evergreen shrub, or herbaceous perennial shrub. Used as an accent or background plant. This is a green accent shrub that contrasts well with other shrubs with lighter foliage. Drought-tolerant; suitable for xeriscaping. Height: About 4 - 8 feet in height. Spreading 3 - 10 feet. Flowers: White, found in clusters, 1 to 1 1/2 inches in diameter. Blooming Time: March - November. Leaves: Gray-green leaves with a serrate edge, up to about 1 inch long and 1/2 inch wide. Found: Found throughout the Chihuahua Desert, Baja California, and Sonora Mexico. Elevation: 0 - 2,800 Feet. Habitat: Chalky/alkaline, Dry, Sandy, Well-drained/light soils. 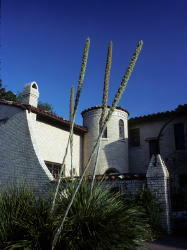 An ideal xeriscape landscape plant in Arizona. Dasylirion wheeleri (Desert Spoon or Common Sotol) is a flowering plant native to arid environments of northern Mexico, in Chihuahua and Sonora and in the southwestern United States, in Arizona, New Mexico and western [[Texas]. It is a moderate to slow-growing evergreen shrub with a single unbranched trunk up to 40 cm thick growing to 1.5 m tall, though often recumbent on the ground. The leaf blade is slender, 35-100 cm long, gray-green, with a toothed margin. The leaves radiate from the center of the plant's apex in all directions-(spherical). 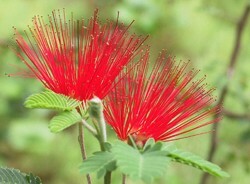 The flowering stem grows above the foliage, to a height of 5 m tall, and 3-6 cm diameter. 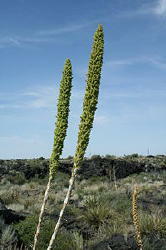 The stem is topped by a long plume of straw-colored small flowers about 2.5 cm long with six tepals. The fruit is an oval dry capsule 5-8 mm long, containing a single seed. Flower stem of the Desert Spoon plant  Cultivation and uses The Desert Spoon is grown as an ornamental plant, valued in xeriscaping. It can be planted any season but summer and pruned in October. The drink sotol is made from the Desert Spoon. It was also used by the natives of the region for food and fiber. Botanical: Dichondria Micrantha "Silver Falls"
Dichondra micrantha is a low growing, groundcover plant that was once touted for use as a lawn in the mild west, but flea beetles quickly drove it out of favor as a grass substitute. Now a related species, D. argentea, is taking center stage nationwide as a unique, trailing accent plant for containers and hanging baskets. Dichondra has small, rounded leaves that resemble miniature water lily pads and spreads by rooting surface runners. Native to Texas and Mexico, D. argentea is a perennial hardy in zones 8 to 10, but is being used as an annual foliage plant in the horticultural trade. 'Silver Falls' dichondra is a vigorous plant that forms a mass of soft pewter leaves on silver stems in full sun to part shade. The fan-shaped, shimmering silvery leaves are held on plants just 2 inches tall. The trailing stems branch well without pinching. It is heat and drought tolerant and will recover quickly if watered after wilting. In the Midwest, dichondra has no serious insect or disease problems. 'Silver Falls' dichondra is great alone or in mixed containers, providing a cool contrast to green foliage and brightly colored flowers. Try it in hanging baskets, tall containers, or window boxes as an alternative to licorice plant (Helichrysum petiolare minus 'Silver Mist'). It combines well with 'Tidal Wave' petunia, 'Angel Mist' angelonia, or 'Dragon Wing Red' begonia. Like other silver plants, it goes well with purple, pink or blue flowers and foliage. For a sophisticated look, plant it with white, pale pink and pale lavender flowers. Other suggested plant combinations include Persian Shield (Strobilanthes dyeranus) and 'Duckfoot' coleus; petunias, ivy geranium and lobeli; or an all-foliage mix with chartreuse and black sweet potato vines. 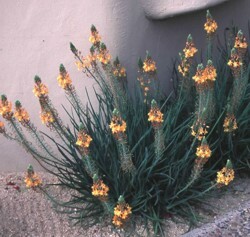 Planted near the edge of a raised bed or rock wall, it will cascade over the edge, growing 2 to 4 feet long. It can also be used as a ground cover on well-drained soils, where it will form dense mats that choke out weeds. Try pairing it with colorful foliage plants, such as 'Purple Knight' alternanthera or sun-tolerant coleus. 'Silver Falls' can even be used as a trailing filler for cutflower arrangements. Description Dyssodia pentachaeta is a small plant, usually no more than 8-10 inches high. This perennial forms in clumps and has opposite, pinnatifid leaves arranged in 5-7 linear divisions. 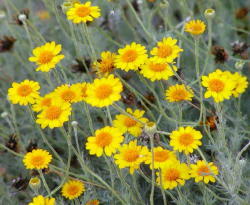 The yellow flowers are ½-inch across and form on slender stalks above the foliage clumps. When crushed (as with most Dogweeds) the aromatics emit a pleasant scent. D. acerosa is another small perennial. It is woody at its base and stands approximately 1 foot tall. The dark green linear leaves are attached to the main stems either oppositely or alternately. Small circular glands are noticeable on the leaf surfaces. The yellow flowers are ¾-inch across and form at branch ends. D. papposa is a small 4-16 inch tall annual. Its leaves are 1-2 inches long, pinnatifid, and linearly divided. The flowers are small and tend to be surrounded by inconspicuous rays. All Dogweeds are aromatic. Judge the medicinal potency of individual plants by their pungency. Distribution Dyssodia pentachaeta is found from 2,500-5,600 feet sporadically throughout southern California, southern and western Arizona, and parts of New Mexico to Texas. Roadsides are a typical favorite of the plant. 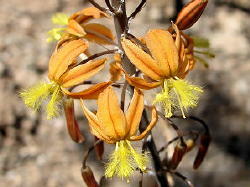 Otherwise, it is found in washes and on dry slopes and hillsides. D. acerosa ranges from western Texas to southern and central New Mexico to southeast and central Arizona, and finally throughout the Grand Canyon area. Look for this Dogweed on limestone soils between 3,500-6,000 feet. 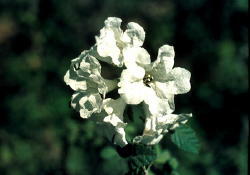 D. papposa inhabits a wide range of territory: from Illinois to Montana, south to Louisiana and Arizona. Throughout the arid southwest, it is often found in waste places – ditches, fieldsides, etc.